There is NO "D" in LIQUI-FIRE because "D" stands for "D"angerous, and "D"estructive products sold by "D"eceptive marketers! #1 in the industry since 1993 because customers who used it are happy to recommend it. We use the most trusted and secure online bank to process most major credit cards. No account is required and we NEVER see your private information. Note: You can increase or decrease your order inside the online bank. Less than a full case are available in multiples of 2's. * Credit Card Users * click, "Do not have a PayPal account" Now you can use your credit card. Can I use it in standing water? I live in a mobile home in Saskatoon, SK and the ensuite bath won't drain, tub, sink or toilet, and when I run the water in kitchen it ends up in the tub. I have tried a snake etc with no luck. Only drain backed up is the tub. I need help, please. Yes, Liqui-Fire will go through standing water. Liqui-Fire is non-toxic with a specific gravity that is heavier than water. As for help, be certain that Liqui-Fire is not sitting in the trap. It must go beyond the trap itself to thaw the frozen section of pipe. Some users have informed us that they heated it in a microwave prior to using our Liqui-Fire. If you chose to heat the product be aware that heated items can burn if they are too hot. Thank you, how long would it take to get to Saskatoon, SK? No hardware store sells it here. To shorten your reading and this page... the customer was supplied a list of approximately a dozen stores in the greater Saskatoon area. You may be able to acquire product at any of these locations if you are near them. 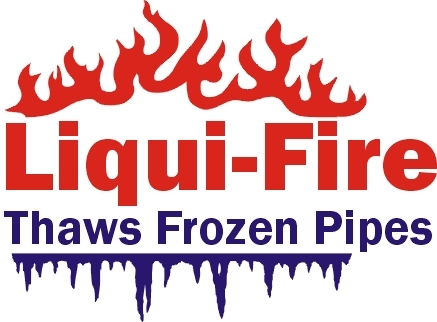 Robert Rozon was informed we ship Liqui-Fire every week day to both Canada & the USA. It was then queried by the Woodsmans International Service Representative... I hope I have been of service to you. Remember to shake the bottle vigorously before using. I purchased 4 bottles from the Prince Albert Coop and they shipped it on the bus. I poured 3 bottles down the vent stack, but no luck yet, still froze up. How much do I need? I was really hoping this would solve my frozen drain problem. Before we could send our response Robert Rozon wrote back. I apologize to you, I woke up this morning and checked and it had done the job. I am so grateful and will recommend your product to everyone I possibly can. Liqui-Fire was a life saver for me.....thanks so much. Other links for thawing or fixing frozen pipes drains sewers and septic pipes lines and septic tanks. Email questions or comments about this web site using the link above. Copyright © 1993 - 30 Sep 2014 Woodsmans International All rights reserved. pour toutes questions ou commentaire a propos de ce site adressez vous au courriel si haut. Droit d'auteur © 1993- 19 Jan 2014 Woodsmans International Tout droit réservé.